The long-awaited day has arrived! 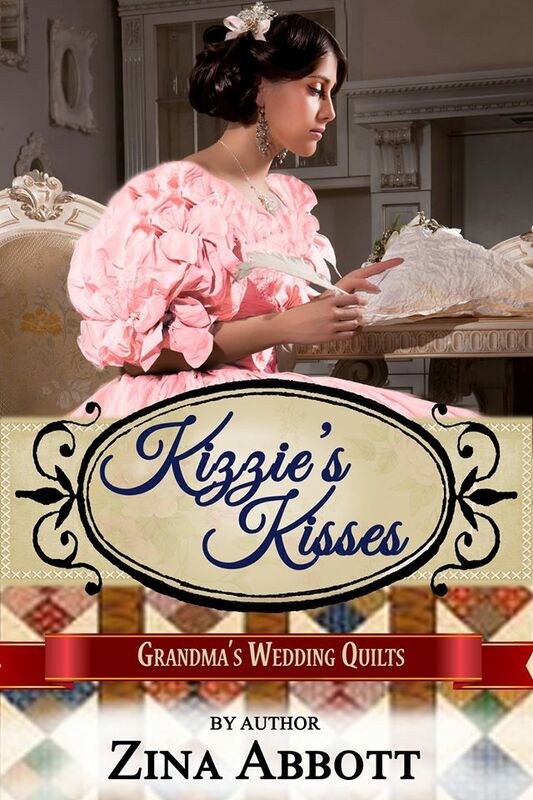 My novel, Kizzie’s Kisses, has been released and is now available. If haven’t purchased it on pre-order, you may now purchase it, download it to your Kindle reader, and begin reading. 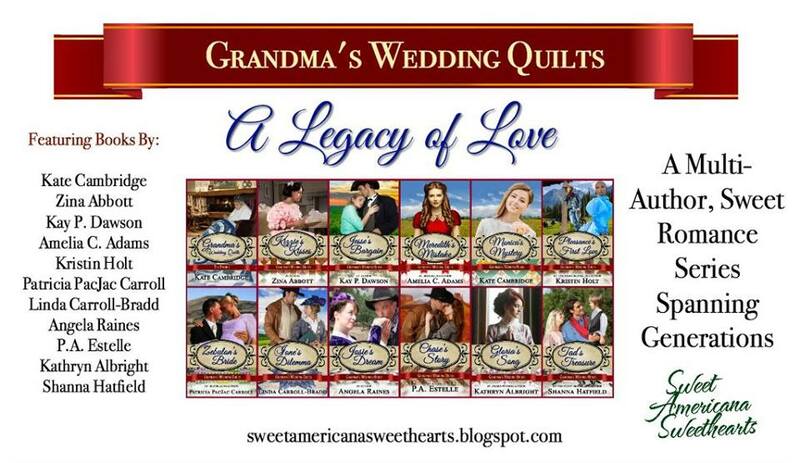 Grandma’s Wedding Quilts – The Prequel, was available for purchase on January 1st. The prequel will give you a taste of what the series is all about. If you haven’t read it, you may purchase it by CLICKING HERE. Kizzie Atwell felt her breathing become more labored. She and her horse had recently clattered over the Army-built bridge crossing the second stream east of the Solomon, so she figured she was not that far from Junction City. From there it was a short distance to Fort Riley, the most westerly of the two Kansas forts along the Smoky Hill Trail. Kizzie reached forward to pat Sugarcone’s neck, a gesture she hoped her young mare would recognize as a thank you. She could sense Sugarcone’s heavy breathing, also. Kizzie had been pushing them both at a dead run ever since she left the family’s farm a few miles east of Salina. Kizzie involuntarily shuddered as the thought of the danger facing her family along with the rest of the inhabitants of Salina once again skittered through her brain. A rider had raced up to their home to warn them that Indians were attacking the inhabitants to the west of Salina and leaving few, if any, survivors. The men they killed and scalped. The children they pinned to the earth with arrows after dispatching them. As for the women, as the rider had glanced at Kizzie and her mother, Jemima, he cleared his throat and merely said the women were “outraged” before they were killed. Kizzie was not naïve; she had a pretty good idea what constituted an outrage against the women. This war party was on the move and taking no human captives, only horses. They were moving from the homesteads on the western-most outreaches of Saline County east towards the town of Salina itself. Those who lived west of the town now fled towards Salina, hoping the grouping of crude buildings could afford them some protection. But, the rider who had reached the Atwell farm advised Jemima, better known as Mima, to flee east to Junction City. Since that town was just west of Fort Riley, they had a better chance of protection there. With her papa, Sidney, along with Uncle Jefferson Atwell gone, there was only Kizzie, her mother, her brother Jesse, age thirteen, and sister Meredith, age nine left at home. As Kizzie watched the man ride off to the north, she reasoned he had already been to the farms owned by her Uncle Jefferson and her Palmer grandparents. After she told her mother she thought Grandpa and her aunt with her family would probably come by so they could all travel together, her mother had sprung into action. For a woman Kizzie knew had been ill and feeling depressed the last several months due to her most recent miscarriage followed by a bout of pneumonia, her mother had surprised her. Mima Atwell had begun issuing directions to her little family so they would have their wagon prepared to go when her step-father, Edward Palmer, and mother, Mary, showed up. Mima had Jesse hitch the wagon and start loading the heavier items. Although Jesse was only thirteen and sometimes acted like he thought he was Kizzie’s boss even though he was two years younger than she was, Kizzie had to admit he could almost handle the work of a full-grown man. While Meredith helped her mother pack clothes and bedding, Kizzie had been put to work setting a pot of water on to boil while she gathered eggs and turned the chickens loose, saving three of her mother’s prize laying hens to crate and take along. She packed the kitchen necessities including enough food to last for a couple of weeks, cooking essentials and her own clothes. When her mother hadn’t been looking, under her blue skirt Kizzie had pulled on her trousers she had altered from an old pair previously worn by her father. Her mother might have them turn the remaining cattle loose to fend for themselves, but under no circumstances did she intend to leave Sugarcone behind. Her family might consider it more seemly for a young woman age fifteen to ride in the wagon instead of being seen astride a horse, but Kizzie made other plans. She had quickly decided she would take Sugarcone, the horse she had received for her most recent birthday, to ride after her father and uncle for help. She loved that horse with its soft molasses brown coat sprinkled with a smattering of white hairs that hinted of a brindle somewhere in her pedigree. Although Sugarcone was not a big animal, she was a strong mare with powerful formation, and she was the perfect size for Kizzie to ride. Kizzie knew she didn’t dare say a word about her plan, or her mother would have insisted it was too dangerous. After all, unlike her cousin, Hannah, the perfect daughter, she had a tendency to do many things her family considered inappropriate for a young woman. She could hear her mother now: It was unseemly for her to ride off by herself. If anyone rode alone to get help, it should be Jesse. As far as Kizzie was concerned, her little brother riding off on her horse was not going to happen. Kizzie had kept her skirts down and her eyes glued on the eggs boiling. She packed the wagon and did her mama’s bidding between discreetly tying a blanket, some grain for Sugarcone, and food for herself behind her saddle. She hid Jesse’s old shirt, waistcoat and jacket behind a pile of hay. Kizzie’s family had collectively sighed with relief at the site of the two-wagon caravan approaching their home, up until they saw Grandma Mary driving the wagon flanked by Atwell cousins, Carl, age twelve, and Henry, age ten, with Grandpa Edward in back, his face red and sweating. As soon as Grandma Mary had explained that Grandpa had wrenched his knee again, Mima had turned to Kizzie with directions to run and put some of the hot water from boiling the eggs into a crock jug along with some willow bark and to bring the rest of the willow bark out to go with Grandpa. Otto Atwell at age eighteen, having been left behind to protect his mother, Carlotte, his two brothers, his sisters, Hannah, age fourteen, and Marguerite, known as Magpie, age eight, may have felt disgruntled about not being included when his father and uncle departed to drive cattle to the fort. Now he found himself the strong man in the family. Grandpa was still in charge, giving directions from his seat in the back of the wagon where he kept his rifle by his side to help protect the family. But, it was up to Otto and Jesse who were more mobile to help to tackle any physical challenges the group might encounter. Kizzie could tell packing the wagon had used up what little reserve of energy Mima had still possessed. She had watched as her mother had crawled into her wagon box next to Meredith and, with a sigh, had leaned back against a stack of bedding. Jessie had climbed into the seat to drive the wagon, settling the shotgun at his feet. Jesse was her younger brother. Who was he to give her orders? Kizzie had merely nodded and headed for the barn. As she heard the wagons slowly start out of the yard, she had quickly pulled off her gown and petticoat and stuffed them into the center of her blanket roll. 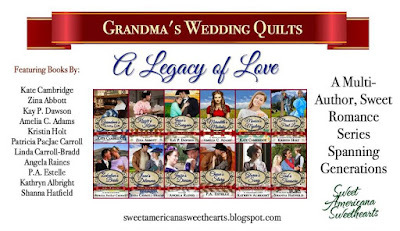 She had donned her brother’s old clothes and piled her braided brunette hair on the top of her head as she pulled on the old felt slouch hat that at one time had been Grandpa’s until one of his horses had grabbed the brim and ripped it. Mima had sewn it back so that it wasn’t too misshapen, and, much to her mother’s dismay, Kizzie had laid claim to it for when she rode herd with her papa and Jesse. As she cinched the chin strap tight, Kizzie had again declared to herself she didn’t care how the hat looked. She preferred it to the sunbonnet her mother usually insisted she wear. The pepperbox pistol her papa had bought for her mama, and which Mima had declared more than once she would never use, Kizzie had tucked into the back of her waistband. She had raised her eyes in gratitude when no one had questioned her about why they couldn’t find it. That three-shot pistol, and the big kitchen knife she had stuck down the side of her work boot were all she dared take for her own protection. The shotgun she had left for Mama and Jesse plus Jesse had his own hunting knife. The rifle Papa had with him, which was why she needed to find him and tell him to forget about any cattle he hadn’t sold yet and come back to protect his family from the Indians. Instead of turning Sugarcone loose or tying her to the back of the wagon for the trek east, Kizzie had climbed into the saddle. She had ignored her family members as they called out to her. She had not looked back as she raced Sugarcone past the wagons and down the lane towards the road leading to Junction City, and after that, Fort Riley. You may purchase Kizzie’s Kisses from Amazon by CLICKING HERE. Please be aware that through today, January 9th, the book will be offered at the pre-order sale price. On January 10th, it will go up to its regular price. 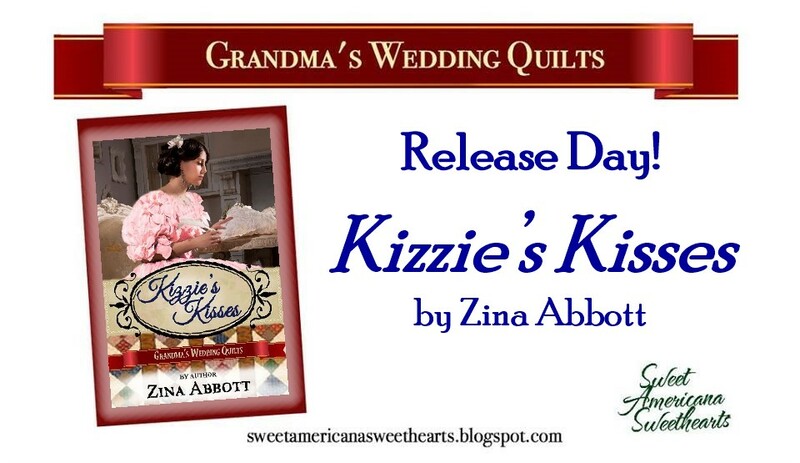 Starting with Kizzie's Kisses today, the Grandma's Wedding Quilts books will be released at the rate of one per day. You will want to read all the books in the series. To find then all in one location, please visit and follow the series page on Amazon by CLICKING HERE.